I suspect I'd be dead if not for antibacterial drugs (most people call them antibiotics, but I'm stubborn and prefer a more specific term). As a preschooler, I spent several months being very ill with tonsillitis. It took more than a couple rounds of bacteria-harming drugs to fix me up, and who knows if I would've been able to kick the infection without them before my throat closed up or my heart failed due to rheumatic fever. Due at least in part to my childhood experience, I'm morbidly fascinated by the possibility one could, although it would be very unlikely, die from a paper cut or a skinned knee. What if our immune system was having an off day and the right person-eating and drug-ignoring bacterium made it into the wound and marched ceaselessly toward a vital organ? We're coated in microbes, both inside and out. Most of our bacterial residents appear to be harmless, but others such as certain Staphylococcus (e.g. MRSA) and Streptococcus species won't hesitate to mow down on us if given the opportunity to sneak past the physical barriers of our skin or the lining of our alimentary canal. So our cuts and scrapes sometimes go red and puffy as they fill up with attacking bacteria and defending white blood cells. If not dealt with using antibacterial drugs, these minor infections occasionally progress to increasingly nasty bacterial invasions. Giant pus-filled cavities can form, limbs can go gangrenous, and bacteria can spread to and cause serious problems in the brain, heart, and/or lungs. Skin injuries (e.g. cuts and scrapes) are commonplace, providing a pathway for disease-causing microorganisms to get inside us and start growing. Skin-to-skin contact frequently occurs in certain sports (see: most of a rugby game), which can spread harmful microbes (e.g. MRSA, which sometimes lives harmlessly inside people's noses) into an open wound. Bacteria, fungi, and viruses can be transferred between players who share equipment or personal items such as razors or towels in the locker room. Players can also come into contact with surfaces contaminated with microorganisms in the various facilities they collectively use. This is pure speculation on my part, but professional athletes seem to spit an awful lot, so they might be exposed to harmful mouth-originating microbes by falling down anywhere near a playing surface. Infections with skin-eating fungi (e.g. athlete's foot), mucosa-ulcerating herpes simplex virus (i.e. cold sores), and flesh-invading bacteria can all be acquired by playing sports. Skin infections caused by bacteria typically show up as infected hair follicles (folliculitis), which can develop into boils (infection of a follicle + the surrounding skin) and cellulitis (infection penetrating down to the innermost layers of the skin, meaning it can spread more easily and so is much more dangerous). These infections usually clear up with the administration of antibacterial drugs, but rarely they will progress to a whole-body illness. Skin infections happen all the time among professional athletes. This can mean missing a game or two, or it can mean a life-threatening illness. Examples of players who've missed time due to skin infections include Paul Pierce (NBA), Joe Thornton (NHL), Braylon Edwards (NFL), and Sammy Sosa (MLB). Seeing as I'm Canadian and so have a natural affinity toward winter sports involving nets and pucks, I've decided to look at a couple of the freakier examples of skin infections involving professional hockey players. One case report I dug up tells the tale of an unnamed player who left a game after a hard hit to his shoulder. A physical examination revealed that his shoulder blade (scapula) was broken. In addition, over the next two days he developed a fever, felt generally really gross, and the whites of his eyes turned yellow. A blood culture (smearing blood on a plate of jello-like bacterium food to see what grows) revealed the abnormal presence of Staphylococcus auerus. This bacterium had somehow made its way into his bloodstream and was now circulating throughout his body, a potentially life-threatening situation known as septicemia or blood poisoning. 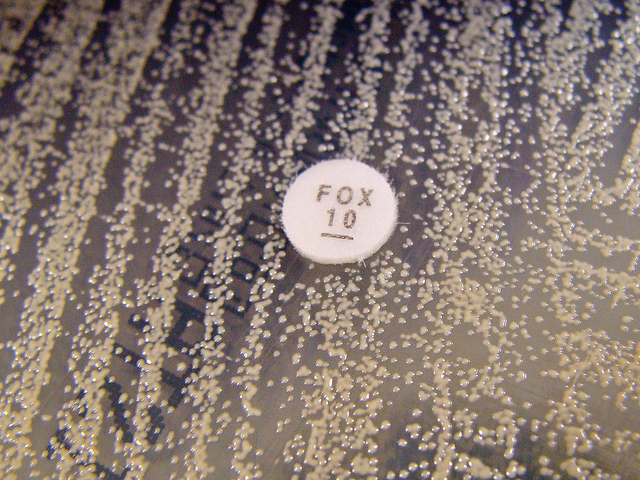 After testing the S. auerus grown from his blood for its sensitivity to different antibacterial drugs, the player was treated with an appropriate drug and his infection subsided. His illness was attributed to an initial infection of abrasions he acquired on his left hand prior to breaking his shoulder (with the S. aureus coming from his gloves). He returned to play several months after his injury. During his time with the Leafs, Mikael Renberg damaged a previously-acquired blister on his left hand while lacing up his skates. This led to it becoming seriously infected with Streptococcus pyogenes. He ran a high fever and was hospitalized. Things were pretty dicey for a while, as doctors contemplated having to amputate his hand in order to save his life. Fortunately, this proved to be unnecessary! I found another case report that appears (it's written in German) to be about a Swiss professional hockey player who was admitted to a hospital with a fever and intense back pain. He recently had reported some lower back pain and a painful Haglund’s exostosis on his left heel during an annual checkup. At the hospital, his condition began to degrade and he was placed in the intensive care unit. He was subsequently diagnosed with a Staphylococcus aureus infection that had spread into his lungs and formed abscesses in his thigh. This infection was thought to have originated from an infected blister on the player's heel. He was released from the hospital after four weeks of treatment with antibacterial drugs, and was able to resume playing within a couple of months. Finally, expanding our circle slightly to encompass all on-ice personal, professional hockey officials are also occasionally struck down by bacterial skin infections. A referee showed up at an emergency room in Rhode Island the day after hitting his elbow against the boards as he dealt with a skirmish during an evening game. After being diagnosed with elbow inflammation (specifically, olecranon bursitis) and associated cellulitis, he was admitted and a needle was placed in one of his veins to drip in a solution of an antibacterial drug. His condition worsened overnight, so doctors switched him to a different antibacterial. The next day was worse still, with the swelling having spread to his hand and upper arm. A culture came back positive for Staphylococcus auerus, while an MRI revealed an abscess with deep tissue inflammation around his elbow. He was switched yet again to a couple of particularly heavy hitting antibacterial drugs and taken into the operating room. His arm was opened up, the abscess was drained, and a bunch of damaged and now dying tissue was removed. The operation was a success, and the ref was back at work six weeks after being admitted to the hospital. Tscholl PM. 2011. Die lebensbedrohliche Haglundferse [A life-threatening Haglund's exostosis]. Sports Orthopaedics and Traumatology 27(3):178-182.